I sometimes find that with my hair type (fine and thin hair), that it is difficult to find hairlines that work for me. Especially products that are meant for damaged hair; because, they can sometimes be heavier on the hair. Overall, I really liked this hair line and thought it worked well for me! It made my hair super soft and smooth! I can get a full day before needing a dry shampoo after this (which is pretty typical). My hair doesn't get much volume when I use this, so I've found myself using this line on weekly basis as a gentle repairing line as opposed to every day. If you have fuller or thicker hair, you can easily use this more often! John Masters Repair Shampoo for Damaged Hair with Honey & Hibiscus ~ $41.00 CAN. This gentle shampoo has a rich lather thanks to a coconut-derived foaming agent, and removes buildup while balancing sebum levels without drying scalp. Perfect for damaged, chemical and color-treated hair, this daily shampoo restores the integrity of brittle strands and helps prevent future damage. This shampoo is a strengthening formula that is meant to start building resilience at the root of the hair to keep it strong and prevent future damage and breakage. I think this line smells really good - it's floral and a little herbal and it reminds me of a spa when I'm using it! I thought this was a good shampoo - my hair was clean and refreshed and not dry at all. It didn't fade and made my hair super smooth! John Masters Repair Conditioner for Damaged Hair with Honey & Hibiscus ~ $41.00 CAN. Organic honey coats strands in essential nutrients and draws in moisture, while organic hibiscus flower extract helps to repair and strengthen strands. This ultra-rich formula features an intensely nourishing blend of organic aloe and sunflower seed oil, plus nourishing shea butter, which work harmoniously to guard hair from future breakage and deeply condition. This is an intensive silicone free conditioner to repair brittle hair. This is a super thick conditioner formula, I actually need very little too apply to my ends to make my hair super soft. It really does feel like it's coating the hair and deep conditioning! John Masters Repair Hair Mask for Damaged Hair with Honey & Hibiscus ~ $58.00 CAN. This weekly rescue for extremely dry, damaged hair restores hair structure, locks in moisture, and protects hair from further damage. A fusion of organic honey and organic hibiscus work together to restore shine, moisture and manageability, while conditioning bacuri butter and mongogo oil replenish strands. Hair is left stronger, softer and healthier. This is a weekly hair mask that is meant to be rich and super hydrating to really repair and refresh damaged hair. My hair isn't necessarily damaged by heat during the week; but, my work recently implemented a hair-up policy so my hair is constantly in a bun or braid all week and the elastics are hard on it. I absolutely love using this on a Friday night at the end of a work week as my hair mask. Also, this packaging is fabulous - I love the pump! It adds to the whole experience when you're not glooping it in to your hair from a tub. And, truly a little bit goes a long way with this! 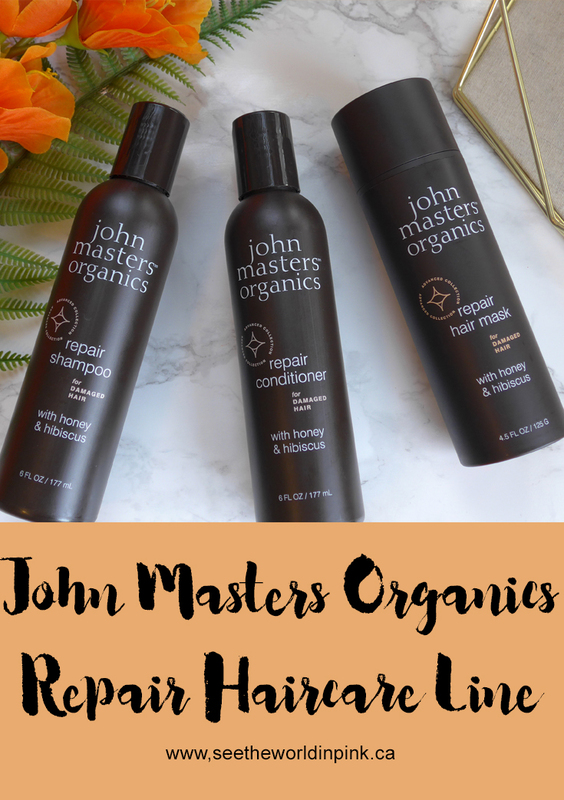 The whole Repair Line is made with over 70% organic ingredients and all of John Masters products are formulated without silicones, parabens, phthalates, mineral oils, synthetic fragrances, and synthetic dyes. They are also not tested on animals! I've really enjoyed incorporating this in to my hair routine! On a weekly (or maybe twice a week) basis, it's nice to have this super smoothing line used. Again, if you have thicker hair that is more damaged than mine, you will have no problem using this more often! But, it's a decadent formula that I love to save after a work week!